This case report discusses the presentation and treatment of a baby boy with club foot deformity. He was initially treated by Ponseti’s method of weekly plaster of paris casting. The club foot did not reduce after 6 weeks of serial casting. The boy then underwent percutaneous Achilles tendon lengthening and placed in a Steinbek Splint. After 12 weeks, the equinus persisted and we decided to perform an open Achilles lengthening. An aberrant tendo-achilles tendon was discovered during open tenotomy and this was released. Once the aberrant tendon was released, the club foot reduced and at 9 months, the baby could walk with good heel strike and the foot was supple with no residual deformity. Congenital club foot is a complex deformity that is difficult to correct. It has a tendency to recur until the age of six or seven years. While there may be a so-called recurrence in an adolescent, this is usually associated with incomplete initial correction rather than being secondary to growth alone. We present a case report of a 15 day-old boy with aberrant tendo-Achilles tendon of the right side which caused an incomplete correction of club foot. 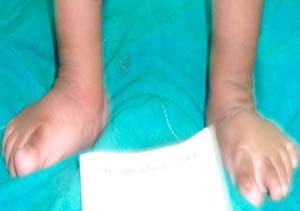 Figures 1 A 15 day- old baby presents with right club foot deformity. The deformity is 3-dimensional with 4 components including cavus, forefoot adduction, heel varus and equinus (CAVE). 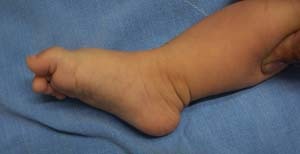 • C-Cavus-increased longitudinal arch of foot. Figure 2 The baby is treated with serial casting by Ponseti’s method of weekly plaster of paris cast. The baby had persistent equinus (Fig. 3A) after 6 weeks of serial POP casting. The foot could be abducted and externally rotated to 60 degrees.A percutaneous tenotomy of the tendo-Achilles was done under local anesthesia. Postoperatively, toe to groin cast with knee in 90 degrees of flexion to maintain the corrected position and to allow tendon healing was applied for 3 weeks. Then the foot was maintained in 60-70 degrees of abduction, external rotation and 15-20 degrees of dorsiflexion by Steinbek Splint (open toe high top straight shoes attached to bar of length equal to shoulder width). This splint is usually worn 23 hours/day for the first 3 months and 14-16 hours/day up to 3-4 years of age. Equinus was found to be persistent. We decided to do an open tendo-Achilles lengthening. Intra-operatively, we found an aberrant tendo-Achilles tendon (Fig. 4) attaching just posterior to the tendo-Achilles tendon and the calcaneal tuberosity. This was released from the calcaneum and the foot could be dorsiflexed to 20 degrees on the operating table. The baby was given an above- knee POP cast for 3 weeks and followed with Steinbek Splint in 70 degrees of abduction, external rotation on affected side and 45 degrees on normal side with 15 degrees of dorsiflexion. Figure 4 An aberrent tendo-Achilles tendon was discovered during open tenotomy. The aberrent tendon was located just posterior to the Achilles tendon and calcaneal tuberosity. At 9 months, the baby could walk with a good heel strike and the foot was supple with no residual deformity. (Fig. 5) At 18 months follow up the baby was found to have a pain-free, plantigrade foot, with good mobility. (Fig. 6) The parents were advised to continuously use the brace for the baby, 14 to 16 hours a day until 3 to 4 years of age. 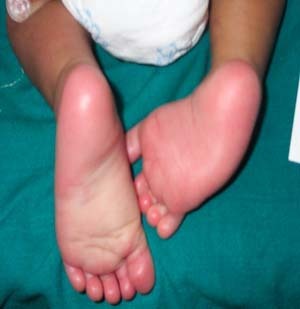 Figure 5 At 9 months, the boy could walk with good heel strike and the foot was supple with no deformity. Figure 6 At 18 months follow-up, the baby was found to have a pain-free, plantigrade foot, with good mobility. Most orthopedists have agreed that the initial treatment of a club foot should be non-operative. [4,5,8,11,12,14,15] The preferred method is manipulation and application of a plaster cast at weekly intervals. Less favored methods of initial treatment are use of a Denis Browne splint, stretching and adhesive strapping, and physiotherapy. Manipulation and serial application of casts, supported by limited operative intervention, yielded satisfactory functional results in 89 percent of the feet. [8,14,15] However, at other institutions, manipulative treatment has resulted in increased cavus deformity, rocker-bottom deformity, a longitudinal breach, flattening of the proximal surface of the talus, lateral rotation of the ankle, and increased stiffness of the ligaments and joints. 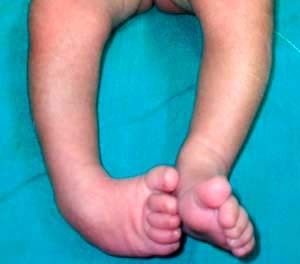 [1,2,3,4] To avoid these distressing outcomes, early and even primary operative treatment of club foot is practiced in some centers [5,7,9,10,12,15,19,23], often with equally disturbing failures and complications, such as wound infection, necrosis of the skin, severe scarring, stiff joints, overcorrection and under correction, dislocation of the navicular, flattening and beaking of the talar head, talar necrosis, and weakness of the plantar flexors of the ankle with major disturbances of gait. An early operation (not later than the second month of life) is indicated only in the small percentage of patients who have short, rigid feet, with very severe equino varus deformity, that do not respond to proper manipulations. Many orthopedists also favor release of the tarsal joints in less rigid feet when manipulations have failed to completely correct the displacement of the navicular and the talocalcaneal alignment to a normal talocalcaneal index. Extensive posteromedial release, with or without internal fixation of the tarsal bones, is the preferred procedure, but there has been much disagreement about the timing of the operation. Recently, more radical [19,22,23] techniques have been tried in younger patients. The objective of all of these operations is release of the tight capsules and ligaments of the ankle and tarsal joints, and lengthening of the shortened tendons of the foot to facilitate placement of the tarsal bones in normal alignment. The baby in this case report had a persistent eqinus deformity even after percutaneous tenotomy. Intra-operatively an aberrant tendo-Achilles was noted and was released from its calcaneal attachment. This could be the reason for the resistant equinus deformity. The literature rarely describes the aberrant tendo-Achilles tendon and the management. The initial treatment of club foot should be non-operative. Corrective manipulation and serial application of casts, followed by calcaneal tenotomy and release of an aberrant tendo-Achilles tendon if found, should be successful in at least 85 percent of patients who are initially treated a few days after birth. High index of suspicion for an aberrant tendon should be there, if there is a resistant equinus deformity alone, especially after manipulation, POP cast correction and percutaneous tendo-Achilles tenotomy. The orthopedist and podiatrist must have a thorough understanding of the deformity and be highly skilled with regard to manipulation and the application of plaster casts. Most relapses can be treated successfully with additional manipulations and applications of casts for four to eight weeks. 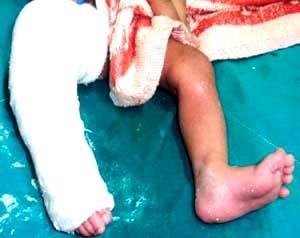 Operative correction of a club foot is indicated when the deformity has not been treated successfully with proper manipulation and serial application of casts, supported by limited operative intervention. Most of these resistant club feet can be corrected with the use of an extensive posteromedial release and release of aberrant tendo-Achilles tendon with satisfactory functional results. 1. Altar D, Lehman WB, Grant AD. : Complications in clubfoot surgery. Orthop Rev 20: 233 – 239, 1991. 2. Beatson TR, Pearson JR. A method of assessing correction in club feet. J Bone Joint Surg 44B( 1): 40 – 50, 1966. 3. Brockman EP. Congenital Club-Foot (Talipes Equinovarus). Bristol, John Wright. 1930. 4. Carroll NC. Congenital clubfoot: patho anatomy and treatment. In Instructional Course Lectures, in American Academy of Orthopedic Surgeons. Vol. 36. pp. 117 – 121. Park Ridge, Illinois. The American Academy of Orthopaedic Surgeons, 1987. 5. Cummings RJ, Lovell WW. Current concepts review. Operative treatment of congenital idiopathic club foot. J Bone Joint Surg 70A: 1108 – I112, 1988. 6. Evans D. Relapsed club foot. J Bone Joint Surg 43B(4): 722 – 733, 1961. 7. Green ADL, Lloyd-Roberts C. The results of early posterior release in resistant club feet. A long-term review. J Bone Joint Surg 67B (4): 588 – 593, 1985. 8. Laaveg SJ, Ponseti IV. : Long-term results of treatment of congenital club foot. J Bone Joint Surg 62A: 23-31, 1980. 9. Lau JHK, Meyer LC, Lau HC. Results of surgical treatment of talipes equinovarus congenita. Clin Orthop. 248:219 – 226. 1989. 10. Levin MN, Kuo KN, Harris CF, Matesi DV. Posteromedial release for idiopathic talipes equinovarus. A long-term follow-up study. Int Orthop 242: 265 – 268, 1989. 11. Lovell WW. Bailey T, Price CT, Purvis JM. The non-operative management of the congenital clubfoot. Orthop. Rev 8: 1l3 – 115, 1979. 12. McKay DW. New concept of and approach to clubfoot treatment: section I principles and morbid anatomy. J. Pediat Orthop. 2: 347 – 356, 1982. 13. Main BJ, Cnder RJ. An analysis of residual deformity in club feet submitted to early operation. J Bone Joint Surg 60B (4): 536 – 543, 1978. 14. Ponseti IV, Campos J. Observations on pathogenesis and treatment of congenital clubfoot. Clin Orthop. 84: 50 -60, 1972. 15. Ponseti IV, Smoley EN. Congenital club foot: the results of treatment. J Bone Joint Surg 45A (344): 261 – 275, 1963. 16. Porter RW. Congenital talipes equinovarus: Resolving and resistant deformities. J Bone Joint Surg 69B (S): 822- 825, 1987. 17. Porter RW, Roy A, Rippstein J. Assessment in congenital talipes equinovarus. Foot and Ankle Int 1: 16 – 21, 1990. 18. Scott WA, Hosking SW, Catterall A. Club foot. Observations on the surgical anatomy of dorsiflexion. J Bone Joint Surg 66B (1): 71-76. 1984. 19. Simons CW. Complete subtalar release in clubfeet. Part I- a preliminary report. J Bone Joint Surg 67A: 1144 – 1055, 1985. 20. Swann M, Lloyd-Roberts G, Catterall A. The anatomy of uncorrected club feet. A study of rotation deformity. J Bone Joint Surg 51B (2): 263 – 269, 1969. 21. Tachdjian MO. The Child’s Foot. Philadelphia, W. B. Saunders, 1985. 22. Thompson GH., Richardson AB, Westin GW. Surgical management of resistant congenital talipes equinovarus deformities. J Bone Joint Surg 64A 652 – 665, 1982. 23. Turco VJ. Resistant congenital club foot – one-stage postero medial release with internal fixation. A follow-up report of a fifteen-year experience. J Bone Joint Surg 61A: 805 – 814, 1979. 1 Registrar in Orthopedics, Department of Orthopedics, St. Stephens Hospital, Tiz Hazari, Delhi, India. 2 Head Professor, Department of Orthopedics, St. Stephens Hospital, Tiz Hazari, Delhi, India. 4 Consultant in Orthopedics, Department of Orthopedics, St. Stephens Hospital, Tiz Hazari, Delhi, India. Phone: 991-23966021-27. 5-6 Registrar in Orthopedics, Department of Orthopedics, St. Stephens Hospital, Tiz Hazari, Delhi, India. Phone: 991-23966021-27. This entry was posted in Uncategorized and tagged aberrent tendo-Achilles, Achilles tendon, Club foot, Ponseti's casting method, talipes equinus. Bookmark the permalink.